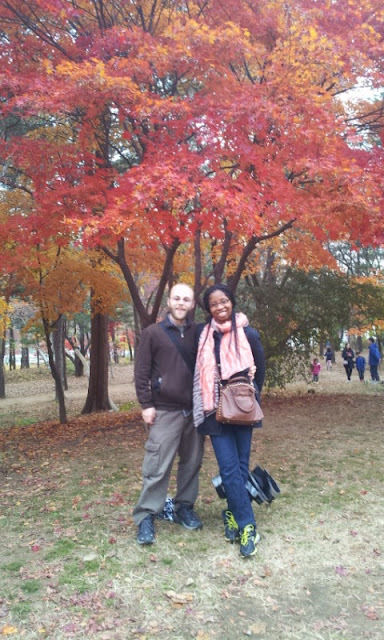 Under the trees at Nami Island. A friend of ours heard about zip lining at the famous Nami Island in Gapyeong, Gyeonggi-do, so went out there this Saturday. 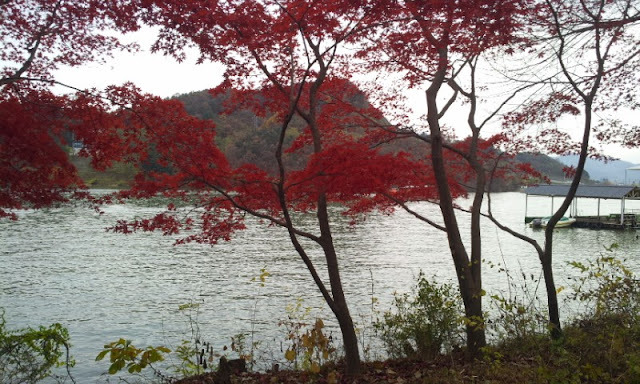 Nami's famous for its trees and scenery and has been featured in the Korea n drama Winter Sonata. As seen below, the island draws a crowd even on cooler autumn days. R and I had been meaning to go to Nami as well as go zip lining for a while, so the trip made a perfect combination of the two. 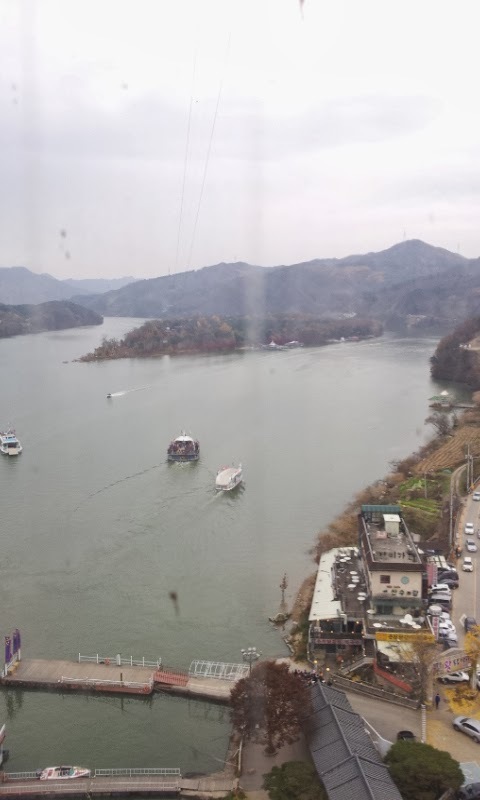 We joined fellow Sincheorwon teacher Jackie and took the 3000 bus out of Sincheorwon and got off in Pocheon, Gyeonggi-do to transfer to the bus to Chuncheon. 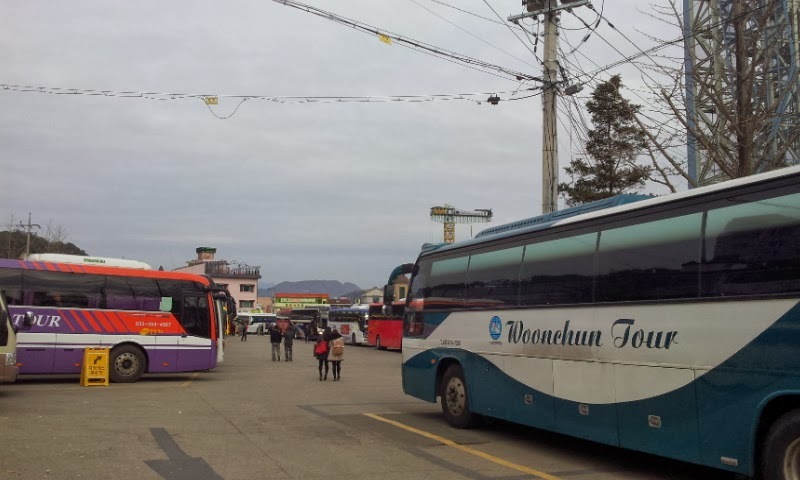 The Chuncheon bus passes through Gapyeong, so we got off there and took the 33-5 bus to the Nami Dock. Once there, we met with our EPIK friends from other areas of Korea and began our adventure. The journey there took around 3 hours. We arrived to find the place bustling with activity, so we got our zip lining tickets and then headed to a restaurant to pass the wait time with some tasty soup and good conversation. 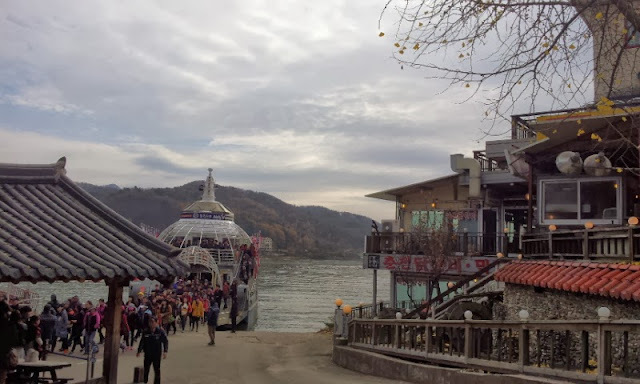 We opted for the longer (and slower) of the two possible zip lines because it allowed us to "drop in" on Nami Island and have a look around before we headed home. The other zip line goes to Jara Island is shorter and faster. Riding the zip line was a fun filled descent into a lovely little island. The wind rippled and the harness bobbed a bit. R's line ended up going faster and somehow I came to a dead stop before I could get out, so an attendant had to push me to the finish line. That made me feel like a kid again. Fun times! It's an exciting minute or so and it's more dangerous than a roller coaster. See below for some photos of the renowned island...our trip back to Cheorwon proved long and eventuful thanks to waiting in the rain, dealing with line jumpers, and running for our bus in Chuncheon. 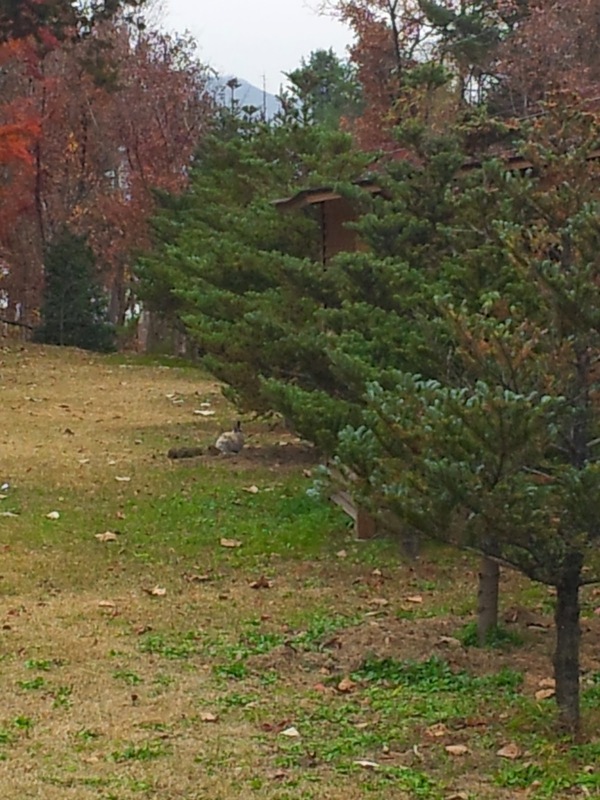 We took the 33-5 out of Gapyeong, got off at the train station, and got on the ITX into Chuncheon. Once there, we dashed to the bus terminal at the E-Mart 10 minutes away. We ran in, got the tickets, and got on the last bus out with seconds to spare. Zip lining at Nami Island. The last vestiges of the autumn foliage. Beautiful stuff. The big field in the middle of Nami. A big ol' statue of a mother and her boy on the island. We found it striking. I snapped this picture while riding the elevator to the zip line platform. 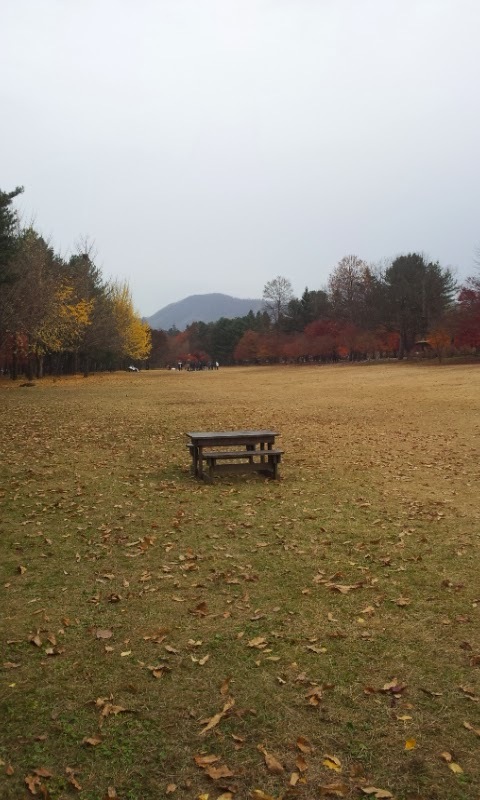 Nami Island is straight ahead. The zip wires are faintly visible. People disembarking from the ferry. The sky looked good, but it quickly got overcast and began raining intermittently. Look closely and you'll see the restaurant sign for dalkgalbi [닭갈비]. Gapyeong's near Chuncheon, which is famous for dalkgalbi. 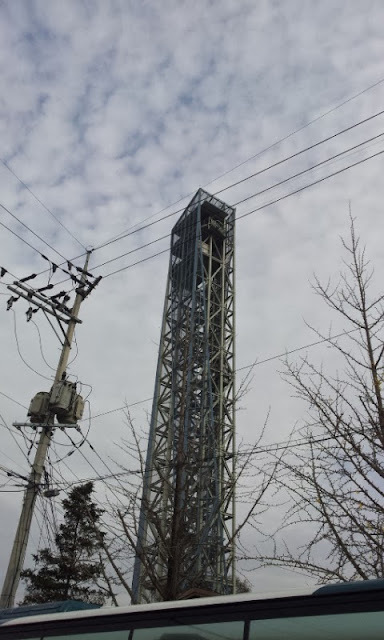 The looming zip line tower. Tour buses here, tour buses there, tour buses everywhere. Sincheorwon to Pocheon: 45 minutes. The ride home took much longer than anticipated. Please be advised: Nami draws the crowds and you will be waiting in line for a bus or taxi. Also please note that you may have to hold your place in line, as a group tried to cut in line. The 5 of us barely made it on the bus. This behavior's uncommon for Korea, but it does happen: Groups have been known to cut in line at the last second for buses.